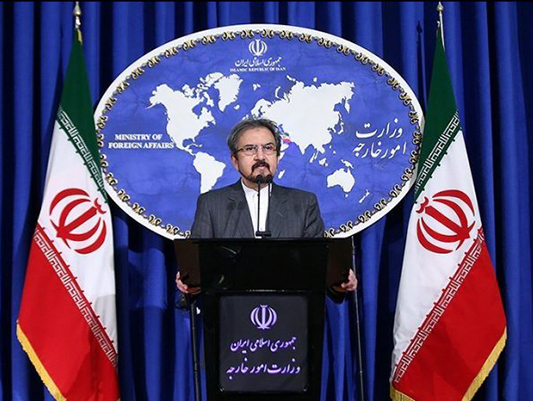 Iran’s Foreign Ministry Spokesman Bahram Qassemi says the Iranian diplomat, who was detained in Germany on the false charge of plotting an attack on an MKO rally in Paris, enjoys full diplomatic immunity. Qassemi on Sunday stressed that Asadollah Assadi, the Iranian diplomat arrested in Germany, has full immunity. His comments came in reaction to reports which quoted him as saying that Assadi’s immunity was limited to the Austrian capital of Vienna, where he was on a mission. The Iranian spokesman said his statements had been distorted in the media reports, and warned that such distortions could result in undesirable consequences. “What I had exactly said was that his diplomatic immunity was linked to his position in Austria. I had firmly stated that, based on the Article 40 of the Vienna Convention on Diplomatic Relations, 1961, Assadi had immunity while proceeding to return to his post, or when returning to his own country,” he added. “Although the Iranian diplomat was not in the country of his mission, we believe he had full immunity under the Article 40 of the Vienna Convention as he was on the way to return to his post,” he said. “Therefore, the media reports that quoted me as saying ‘Assadi’s diplomatic immunity was limited to Vienna’ are not only incorrect, but also totally contradict my statements,” Qassemi went on to say. Assadi was apprehended in July near the German city of Aschaffenburg on a European warrant alleging his involvement in the plot to bomb the gathering of the Mujahedin Khalq Organization (MKO) terrorist group. His arrest came after the Belgian police reported a couple with Iranian roots was stopped in the country with homemade explosives and a detonation device found in their car. A German court said earlier this month that it had approved the extradition of Assadi, who was wanted in Belgium on suspicion he was part of the failed bombing plot.